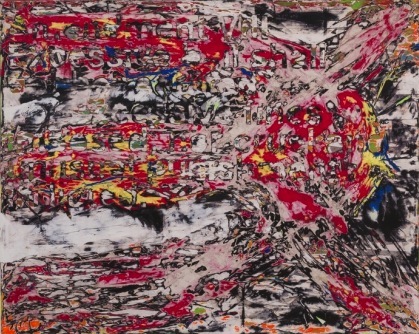 White Cube São Paulo currently present a new exhibition by Los Angeles-based artist Mark Bradford. Known for his multi-layered collaged paintings incorporating materials found in the urban environment, Bradford has created a series of works that combine abstract imagery with social content. Themes of democracy, power and freedom resonate through the paintings. 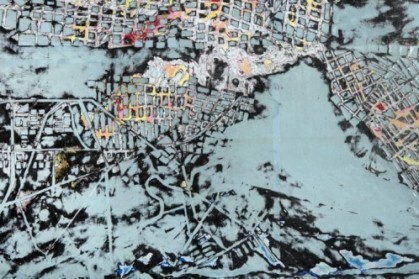 In My Whole Family is from Philly, an ambitious and complex composition, Bradford has laid numerous layers of paper –remnants of billboard posters found in his neighbourhood, along with digitally-printed colour sheets and newsprint – and partially excavated sections by cutting and sanding into the stratum below. In doing so, he reveals an intricate network of pathways and conduits, along with sweeping passages of exuberant colour, echoing in part the cartographic characteristics of the city of Philadelphia, the location where the US Declaration of Independence and the Constitution were originally signed. Regarded as the cradle of American democracy, the ‘Philly’ (as it is colloquially referred) of the title, provides a backdrop to the geopolitical divisions and social inequalities that continue to shape political debate in the US, referenced throughout the works in this exhibition.